I use the app to manage events in my life. I sync all events with Google Calendar and I sync many of my Trello boards deadlines with iCal. I use Fantastical's natural language input together with many Typinator expansions to make new events in seconds. I always view my events from Week view. And show 5 days only with all 24h shown for all days. This lets me have a perspective over what I have to do know. What deadlines I have to complete soon. And gives my the freedom to adjust my schedule in light of upcoming deadlines and events. 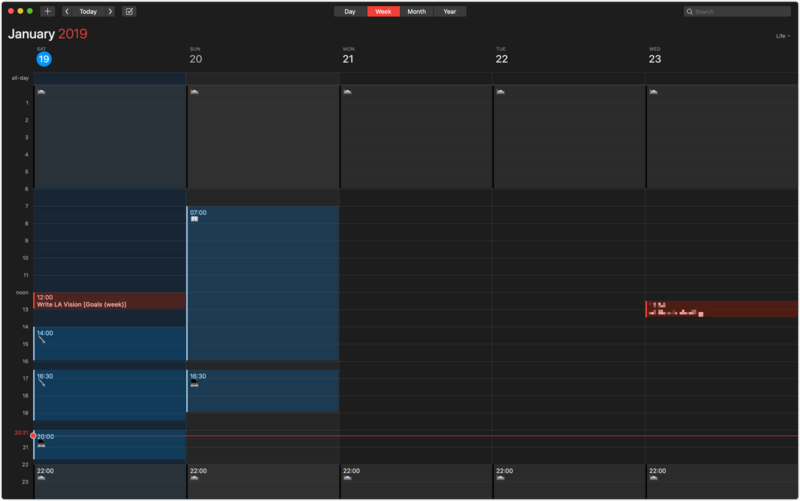 I use KM macro that when going to Month view, will hide away my Routine calendar so I can only see events that matter to me and get a quick glimpse of what deadlines and events are going on in my life and when. And I often use all day events as a way to set deadlines for myself. I then plan events for the day(s) in accordance to my Focus board & deadlines I have. To mass delete events, make empty search query (single space) on events I want to remove and delete them. Can also use stock Calendar app and search for "" and cmd+shift+arrows events I want to delete. ​Google calendar sync select page allows you to select which calendars you want to sync to external apps like Fantastical. Useful for letting Fantastical know about Other calendars which by default don't sync.